My living room is the first space guests see when entering my home. I like to have it at its best at all times. 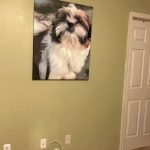 I recently decided to give my living room an inexpensive update for the new year. 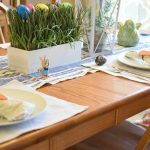 I’ve found several simple ways to freshen up the space without spending a lot of money. One way I create a new look is by updating the throw pillows on the sofa. 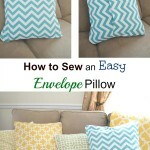 I regularly sew easy budget envelope pillow covers for my sofa’s pillows. 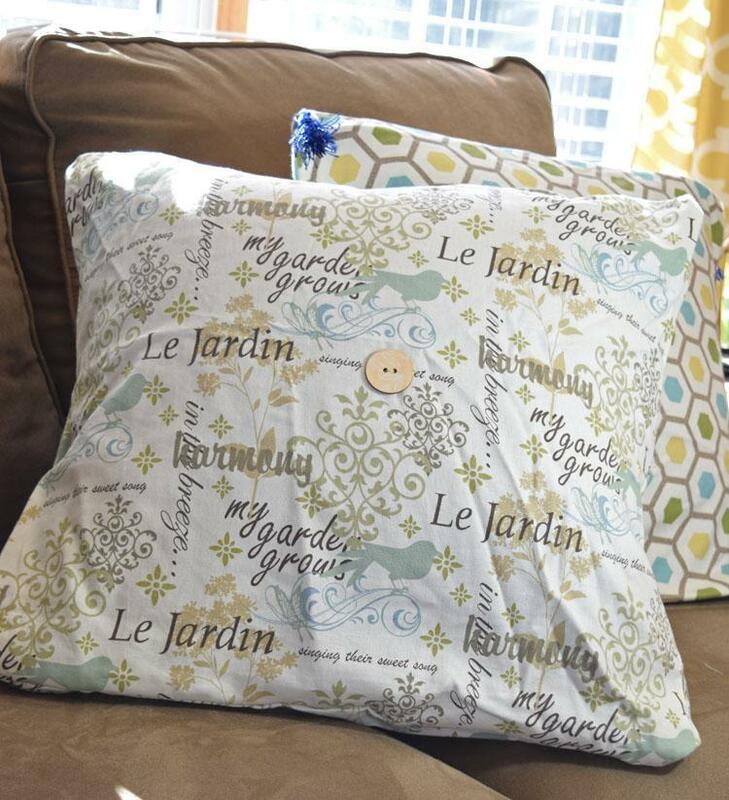 These throw pillow covers are not hard to make — I’m only a beginner when it comes to sewing and I can pull it off. 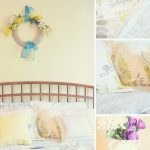 For the new year, I decided to add some spring-themed throw pillow covers I made. 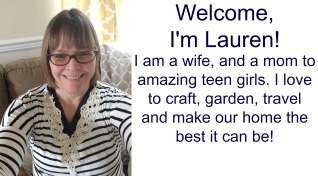 (Check out my tutorial for this quick project on my home page.) Even though groundhog Punxsutawney Phil has predicted a long winter, I hope that spring will be here soon! My pillow covers have bright greens, blues and yellows, and one pillow has a garden theme. If it’s not spring-like outside, at least my living room will look more like spring. 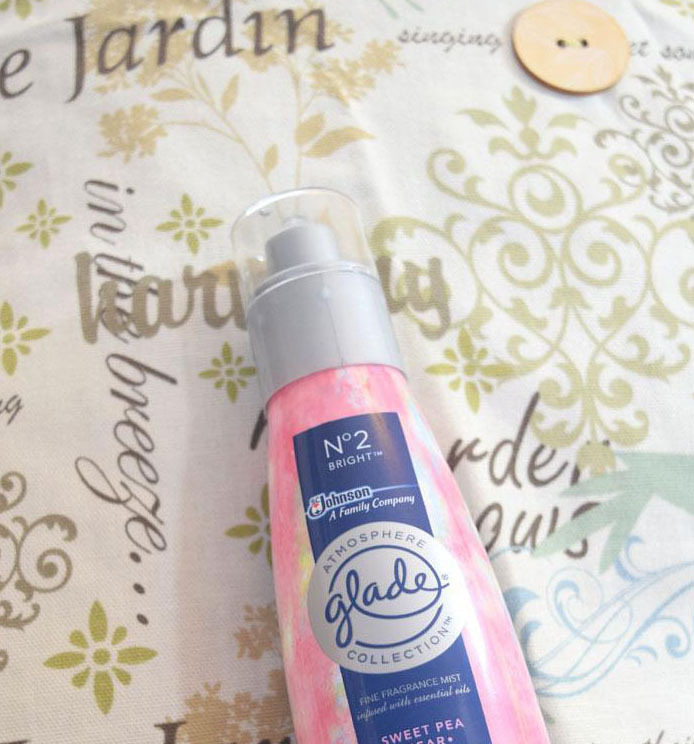 I also picked up some Glade® Atmosphere Collection™ Fine Fragrance Mist products at my local Walmart to add the sweet smell of spring to the living room. 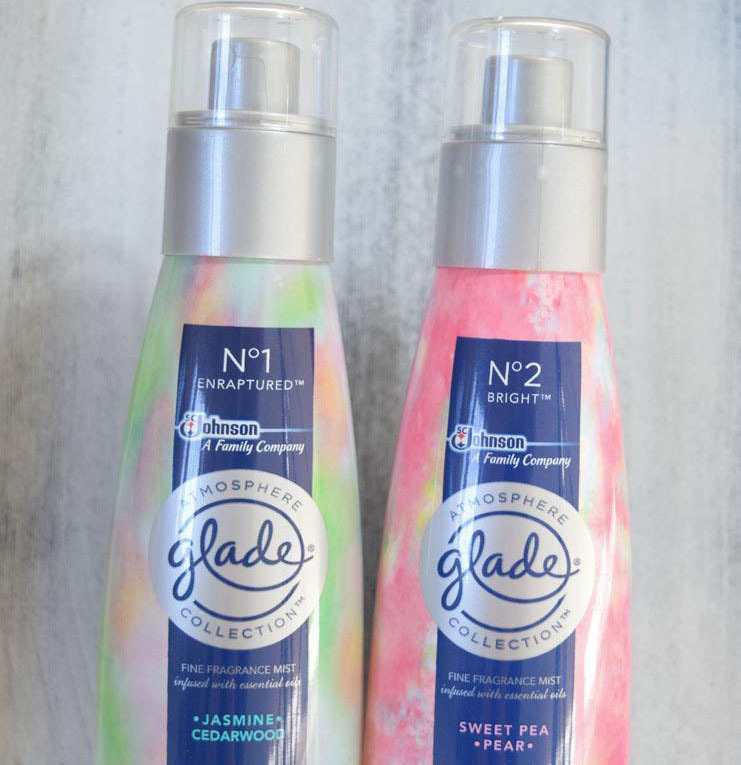 The Atmosphere Collection™ Fine Home Fragrances by Glade® feature essential oils and expertly crafted scents. These room sprays are comparable to more high-end room sprays, but are priced more affordably. My favorites in the collection include the No.1 Enraptured™ fragrance mist and the No.2 Bright™ fragrance mist. No.2 Bright™ fragrance has scents of raspberries, jasmine, rose and sweet pea, with powder musk, sweet tonka bean and sheer blonde woods scents. No.1 Enraptured™ fragrance includes jasmine, rose, pink lady apple and honeysuckle. 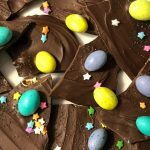 There’s also a hint of honey, cedar wood and spicy clove bud notes. I love the scent of roses, so both fragrances are perfect for me. I also like to change up the display on the ottoman coffee table that sits in front of the living room sofa. My family has lots of books, so I often switch out the books that I display there. I added a pretty white lantern, in which I put a leafy green succulent plant. Having some greenery in the house helps me get through the long winter! 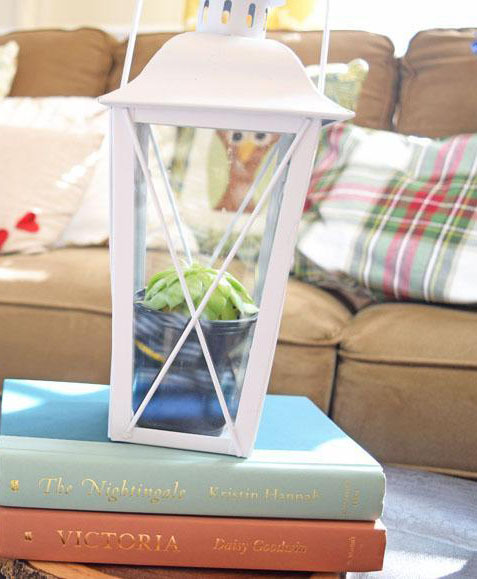 The lantern and books sit on a beautiful log round slice — I like to bring natural elements into the home. Now that my living room is ready for springtime, there’s hope that we’ll have spring-like weather soon! Have you updated your home’s living room lately? I’d love to hear about it. I hope we’ll have some Springtime weather soon, too!! 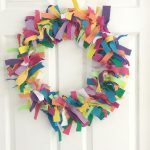 These scents sound so perfect, I love having a home that smells good or a nice spray to use before guests come over!